I’ve always loved writing. Years before Unraveling existed, I scribbled in notebooks, stayed up late writing into the wee hours of the morning, and even brainstormed ideas into a tape recorder on long drives. But it’s also a hard process. You have to find the time to work, which means ignoring those friends and family who want you to come out of your cave and do something other than write. You have to sometimes force yourself to work through a tough scene or disregard the fact that you think the words you’re putting down are terrible. And you’re never done. You’re always tweaking, rewriting, adding, cutting, and trying to make those revision notes work. With Unraveling, I discovered that’s the least of it. Because the road to publication is a new beast altogether. It’s an emotional journey. It’s hard, wonderful, terrible, and beautiful all at the same time. There are highs and lows--moments when I wanted to hug random people in the street and moments when I wanted to just curl up on my couch and resume watching bad television. It’s not like anything I’ve been through before and despite the rollercoaster aspect of it, it’s not something I would ever want to change. Because the high points make everything worth it. 5. Reading Reviews. This is something I didn’t expect. Before Unraveling I was always one of those people who never wanted to share my writing with anyone. Not even my family. And I didn’t want to talk to anyone about it. But now that reviews are out, I’ve found it’s wonderful and inspiring to read the reviews. Hearing that people love the book and just really *get* what I was trying to write is the best feeling. I wrote words that made people feel something. That’s an incredible thing. 4. Finishing Revisions. I discovered I’m not as good at revising as I expected. I revise a lot as I go, and I thought that would prepare me. But it didn’t. When I was editing Unraveling, I added about 18k words and then cut about 8k words from other places in the book. I had to examine my motivations for character decisions and plot elements. I couple times I had to justify why I didn’t want to do a particular revision. I also did a lot of staring at my computer screen wondering how I was going to accomplish the task before me. But when I was done, when Unraveling was accepted and went into production, it was a wonderful freeing moment. 3. The Call. I got the call on March 4th when I was at Cafeteria eating macaroni spring rolls (these are to die for) with three friends. My agent called. She asked me to come to her office. When I got there, I was nervous. It seemed too soon for good news, but she said, “We have an offer. It’s a pre-empt so we have to get back to them today.” I couldn’t process it right away. I had barely come to terms with the fact that the manuscript was on submission or that there were people like my agent who thought it was good enough to be published. I actually just started to cry. 2. Getting First Pass Pages. I spent a lot of time between the call and publication in some kind of state of disbelief. There’s so much waiting between an offer and the book’s release date, that I relegated a lot to do with Unraveling to the back of my mind and continued to go through my daily routine. When my first pass pages came in the mail, it was impossible to do that. Here were the words I wrote laid out like an actual book. 1. Finishing the First Draft. First and foremost I write for me. I write because I love it, because I’m driven to, and because sometimes an idea latches onto me and I can’t stop thinking about it. And I write things that I want to read. Not everything is good. In fact most of it will never get past a folder on my desktop. A lot of it will be just random scenes or discarded set ups to different novels. But then there are the few ideas that are special. The ones where the characters come to life, the plot lays itself out like a map that’s easy to follow, and I’ll spend weekends lost in a different world. And there is no greater feeling for me than finishing the first draft of one of those ideas, and knowing that no matter what happens, I’ve just written a novel. Thank you so much, Elizabeth! Luckily for us, the end result is simply amazing. Unraveling is already high up on my list of all-time favorites. I'm actually ready to reread it already. To celebrate the US release of Unraveling, we have decided to give away one copy internationally. The rules are always the same: just enter the rafflecopter below, keep your fingers crossed, and even if you don't win, make sure to get a copy some other way because this is not a book you'll want to miss. Thanks again to Elizabet and as always, thank you, guys, for reading. Thanks so much for this giveaway! I have been very excited for Unraveling since reading your review on Goodreads, Maja :). I've been looking for a good YA book. Hopefully Unraveling will be it! Thanks for sharing your publishing experiences - fascinating. I'm looking forward to reading the book. Thanks for the giveaway! Thanks for giving us some insight about the process of writing and publishing. I can't wait to read Unraveling. "First and foremost I write for me. I write because I love it, because I’m driven to, and because sometimes an idea latches onto me and I can’t stop thinking about it." So true! Thank you for sharing such a great interview. It gives me even more motivation to keep writing. Since you wrote the review about this book, I have been dying to read it. I love the UK cover and as per usual, your recommendations always climb high on my list =)! Wonderful giveaway! Great interview! I am so excited to get my hands on this book-- only one week to go! I've heard a lot about Unraveling because it has been featured on so many YA book blogs in the last few weeks. The story sounds really interesting and pretty intense. It would be great to get a copy right around the U.S. release date. Thanks for the giveaway! I've been reading reviews for this and can't wait to read it! It's always nice to find a good Sci-Fi book and it's great to read about what the author thinks, great post! I want to read this book SO bad!! 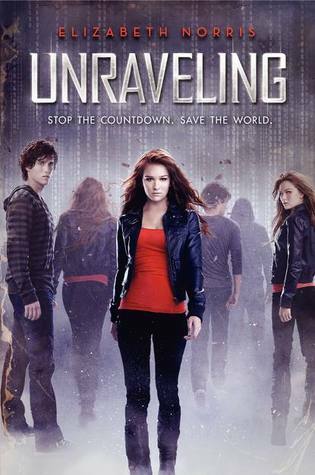 Other than Onyx (Armentrout), Unraveling is the book I'm looking forward to the most in 2012! I can't wait to read it looks soo good! Thank you, Maja, for hosting me! I would love to win a copy of Unraveling, and after I read it (I'm greedy that way) I'll put it up on the Pens for Paws Auction! Thanks for this insight and encouragement, Liz. It must be really cool to live in the same city as your agent so you can actually meet face-to-face. To those that are on the fence about getting UNRAVELING, get off the fence and pre-order it. It really is a great book--one of the best I've read this year so far. You won't regret it. Fantastic Giveaway! I love the sound of this book! This was such an interesting guest post, thanks for having Elizabeth on the blog, ladies! I'm going to skip the comp because I should be getting a copy soon, but your review was definitely my main reason fro requesting a copy! I always feel better when authors talk about all the work that won't ever get past their desktop. I'm still in that stage where I'm hyper-aware of how much work I have to do until my writing will be any good, and it's encouraging to remember I'm not the only one with discarded work on my computer! I can't wait to read Unraveling. Thanks for sharing and thanks for the giveaway! I've heard nothing but great things about this book. I can't wait to read it! If this gets the seal of approval from you, Maja, then I'll have to read it! I'm curious about this book because of the glowing review that I've seen posted here. :P Thank you, Lisa and Maja for the international giveaway. And thank you, Elizabeth, for sharing something about your writing. Now I want to try those macaroni spring rolls. Maja, thanks for introducing me to this book that I plan to read in a few days. Elizabeth, macaroni spring rolls?? And I saw that they have fancy chicken and waffles too?! Clearly, you are a person of great taste. :) I loved reading about your highs. Can't wait to read your book! I believe maja and her reviews so I'll definitely read this book soon. Sounds good from the review! And tell me more about those macaroni spring rolls! Thanks for sharing. I'm glad you got the call so soon! Lovely post as always, ladies. :) I've been so excited to read this ever since I read and loved Maja's review on Goodreads. :) Thank you for the fantastic giveaway! From the cover to the summary, and now this insightful post: I very much want to read this one! Thanks so much for the giveaway! This book looks so awesome!!!! Very insightful post. The cover looks awesome and it's Sci-Fi so even better. I read an ARC of this book and FELL IN LOVE. But then I had to pass it on, because it was for an ARC Tour:( So I would LOVE to have my very own copy to pet and treasure:) Thanks girls! Maja I love reading your posts!!! And I loved reading this authorview! First of all - what a great guest post! I've heard many amazing things about this book before, but this is actually the first time I had the pleasure of learning a bit more about its author - and I fell in love instantly! Elizabeth seems like a very nice, genuinely friendly person. Her insights into becoming a published author were really interesting to read about. I can only imagine how stressful AND exciting at the same time it is to read reviews of your "baby"- thanks for sharing this with us, ladies! I'm really interested in this book. Can't wait to read it! There is no need for me to repeat how much I love Elizabeth Norris and her book. It is nice though to 'hear' her taking about bringing to life this amazing story :) Lovely post, girls!